Want to live like Lady Gaga? 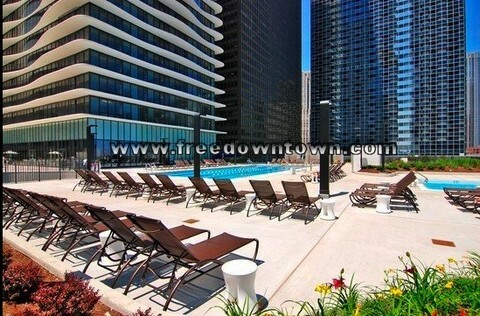 You can at Aqua apartments in Lakeshore East! Ever wonder where celebrities like Lady Gaga reside at when they’re not in L.A.? Downtown Chicago is home to many stars that fall in love with all of the entertainment, restaurants, and culture that the city has to offer. The luxury Aqua apartments at Lakeshore East, home to Lady Gaga and many others, can provide you with everything that you need to fully enjoy the glamorous city life. 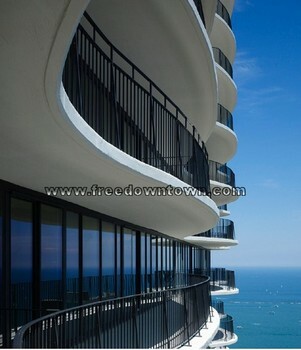 Aqua, located on Columbus Drive, is at the heart of numerous Chicago favorites and landmarks. 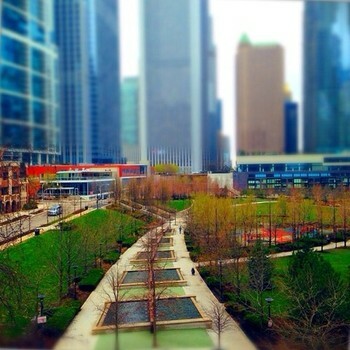 Living at these beautiful, state-of-the-art downtown Chicago apartments gives you quick access to taking pictures with The Bean at Millennium Park, shopping on Michigan Avenue, and a perfect view of the Chicago River. The stunning, fluid design of the Aqua tower gives the illusion of water cascading down the surface of the building. It’s previously won the Emporis Skyscraper Award — a world renowned distinction, for its groundbreaking design. Standing at 87 stories tall, these high-rise apartments include unique curved balconies that provide you with a panoramic view of the city. 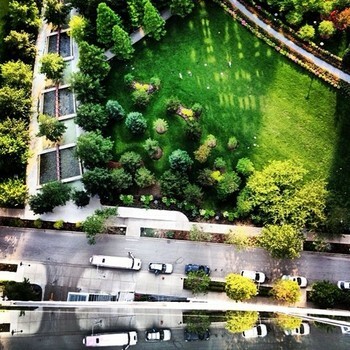 And, it’s even LEED designed to perfectly fit in with the green community of Lakeshore East. The luxury apartment interiors are equipped with ceramic tiled entries, floor-to-ceiling windows, full-granite kitchens, walk-in closets, stainless steel appliances, and in-home laundry devices. With rates starting at $2,200, one of these magnificent downtown apartments can be your next home. For your entertainment needs, Aqua has The Shore Club — 115,000 square feet of luxury indoor and outdoor amenities. As the largest amenity deck in Chicago, Aqua offers indoor and outdoor lap pools complete with cabanas and hot tubs, a sauna and steam rooms, a basketball court and fitness center, and even a Media Room with theater-style seating. If you’re looking to get pampered, there are plenty of massage and treatment rooms for your convenience. If you want to unwind, there are lounges to relax in, gardens to leisurely walk through, and a peaceful outdoor fire pit — a prime location to sip a glass of wine and hang out with your friends. Are you ready to join this fabulous community? Today can be the day! Call us or stop by our office at 180 N. Wacker to speak with a friendly and knowledgeable agent about your downtown apartment search!